A Tree or a Costume? This homemade costume for kids entered our 2011 Halloween Costume Contest, and won a special prize in the Most Creative Costume nomination! Our teen daughter, that's who! 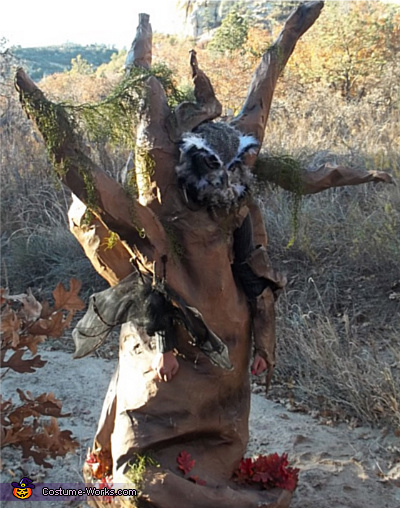 This year our 13 year old went as a Haunted Tree with an Owl perched in her branches. Many hours were spent building her life-sized paper mache tree. Her owl head was made from an old knit hat, plastic masquerade mask, sheet foam and lots of feathers. She climbed into the tree from the back at the bottom. We hid the wheeled frame with paper mache tree roots (had to be on wheels due to all the layers of paper mache, making it heavier that expected). She freaked a few people out at her brother's school carnival by standing near the door and sneaking up behind them. She even had one onlooker poke her in the eye to see if she was real or a decoration, which left her pretty unimpressed. What great costumes!! You are creating awesome memories your children will pass on to their children. What a great costume! I am amazed at your skill and creativity. Holy cow, this is amazing!!! Great costume!! Very realistic and scary!! Awesome! Will never look at a tree the same! This is fun! Love this costume. So creative! Wow!! That is really incredible! Great skill & detail :) This looks like a prop you would buy from the Halloween store! That's awesome cass!!!!! You have my vote! You girls should be very proud of yourselves! Who who is it? Lol. It's our baby girl Kiya...hard to believe she was so little when we were back in the mountains:). Lil Hawk was so liitle then too...amazing how fast time flies! Great job on your custome!! It looks very real, this is awesome! Now THAT is one spooky tree. How many hours went into that, I can only imagine. And the work that went into it. Crazy cool. If it weren't for the hands sticking out at the end, it would be very hard to tell--tree or costume? She and I spent about a month working on it after dinner until bedtime. Many many hours of gooped up hands forming the paper mache on the limbs etc. Was much more fun after the 1st layer was done, since it kept sliding off to start with. Great costume! How did you come up with that idea...very original! Haven't seen anything that cool in a while!!! You always have the best costumes! Wow. perfect, great job and would have scare the hell out of me if I would have seen it in real life.